Market Square is the largest commercial district in Sunnybank Brisbane. Chinese residents from the surrounding areas and newly immigrated Chinese often come here to shop and enjoy the restaurants. 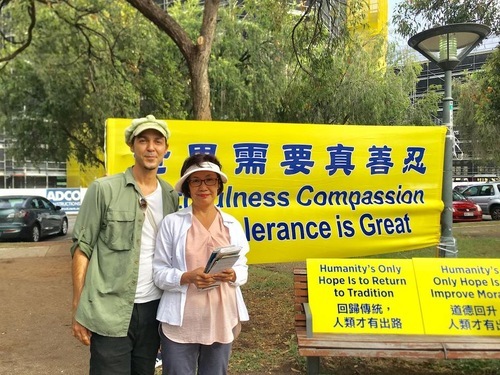 In order to tell people about Falun Dafa and how the practice is persecuted in China, volunteers hold an information booth and demonstrate the exercises there on weekends. Vincent returned the following Saturday and learned the rest of the exercises. He also met the other local practitioners. Geoffrey from Singapore used to teach at the University of Queensland. He told a practitioner that he first heard about Falun Dafa in 2008. That day, he watched practitioners do the exercises for two hours and he felt a strong energy field. 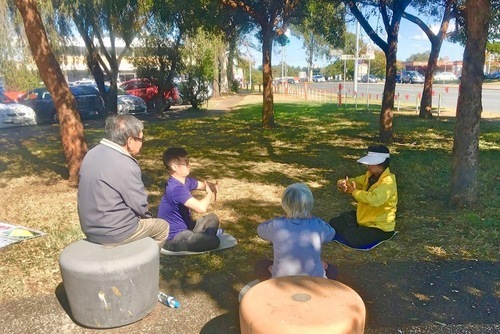 When he visited Market Square last year, he saw the group doing the Falun Dafa exercises, and he asked where he could learn. When he recently came by the site, he excitedly said that he finally had time to learn. He managed to complete the entire “holding the wheel” exercise for 30 minutes. Geoffrey said, “Some positions must be held for a long time, and it was difficult. But I felt so relaxed and comfortable afterwards!” He said he’s pleased to finally learn and he would continue to practice the exercises. Felix is from Korea and works in Australia. He was very happy to see practitioners when he visited Market Square. That day, Felix learned the entire set of exercises. Even though it was painful for him to meditate, he managed to sit for half an hour. Before leaving, he wrote down his contact information and asked to be notified about future activities. Felix (purple T-shirt) learns the exercises. Ms. Gim said many Chinese, including from mainland China, Taiwan, Malaysia and people from many other countries come to Market Square to shop and eat. “A new semester has just begun, and several newly arrived Chinese international students were surprised to see us. They took a lot of photos. They were even more surprised when they noticed the western practitioners!” she said. Ms. Gim and the other practitioners who regularly come to the site often meet Chinese who still don’t know the truth about the persecution. The practitioners plan to continue their efforts to help more people to learn the truth and to wish them a bright future.